NASA’s Valkyrie (R5) robot will never slip the surly bonds of Earth. The humanoid space robot is destined to spend the rest of its days on terra firma with the rest of us. But like Robonaut before it, the six-foot, 290-pound piece of machinery represents a link to the future. She’s a first step toward a goal of human colonization of Mars and beyond, a wonderful dream for a robot currently tethered to the ceiling of a warehouse in snowy Lowell, Massachusetts, an hour’s drive outside of Boston. The Lowell model is one of four units produced by NASA . The space agency held onto one robot for its own purposes and awarded two as research loans to Northeastern University and nearby MIT, while a fourth was acquired by Scotland’s University of Edinburgh. Northeastern acquired the $2 million robot in 2015, when Electrical & Computer Engineering Professor Taskin Padir penned a proposal outlining a plan to help NASA test the hardware for its Space Robotics Challenge, an open competition designed to help prep Valkryie’s successors prepare for the important task of setting up hostile Martian terrain for human settlement. All told, it’s a pretty ideal arrangement for all parties involved. 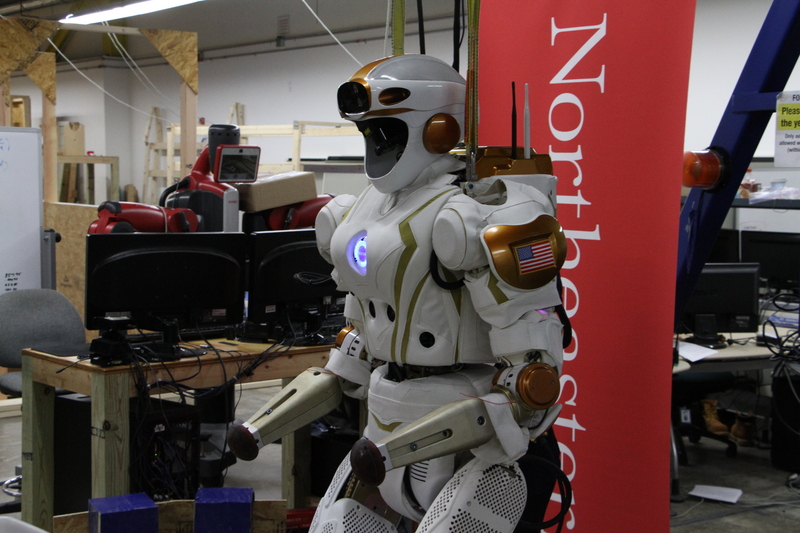 Northeastern and MIT get access to $2 million state of the art space robots and NASA gets to outsource research for the platform to eager robotics and engineering students. Northeastern relocated its model to the NERVE (New England Robotics Validation and Experimentation) Center, a large warehouse space operated by UMass Lowell that houses large obstacle courses designed to put test robots and drones through their paces. It’s an ideal environment for testing Valkyrie’s on-board vision systems and bipedal locomotion, setting up cramped and difficult-to-navigate surfaces to mimic the capsule and space walks some future generation robot will hopefully encounter one day. For now, Valkyrie is attached to the warehouse scaffolding — not because the robot is incapable of standing on its own, but rather because the robot’s price tag prohibits the team from taking any unnecessary risks. It’s a bittersweet sight. The bright white robot looks precisely as one would imagine, a cyborg counterpart to its astronaut brethren. In place of its eyes are a long, dark visor that houses a complex 3D vision system, and in the middle of its chest, a NASA icon glows a color identifying its operating status. On the rear, a backpack houses a large battery that keep the system running. Valkyrie hands, usually as articulate as the rest of its modular body, have been swapped out for equally weighted dummy versions ahead of our visit, sent back for repair at NASA’s Johnson Space Center. When in place and fully operational, they’re capable of manipulating their surroundings, with hopes that future versions might one day perform space walks and partake in other tasks to keep her human counterparts out of harm’s way. She’s still a far way from the cyborg robots of science fiction, but she’s an impressive piece of machinery nonetheless. And her creators and support team have clearly humanized her, going so far as assigning her a gender based on a pair of large actuators that cause her chest plate to jut out on either side of the NASA logo. Her next task, however, is the Space Robotics Challenge. In late January, the competition was narrowed down to 20 teams, competing for a $1 million prize. Over the summer, the finalists will compete in a virtual challenge scenario that finds Valkyrie newly landed on the red planet. It is, sadly, as close as Valkyrie will likely ever come to actually visiting our celestial neighbor. It’s important work nonetheless, even if the robot never finds its way outside her current warehouse home.